Offered here is “DISTURBING ELEMENTS – A LIVE WIRE” an original MULTI-IMAGE MUTOSCOPE Arcade Card from the 1940’s. These 6 image cards are some of the rarest Mutoscope Cards. This card is rated “SCARCE” by the knowledgeable folks at Mutoworld. The card is a lithograph on heavy card stock and measures 5 1/4″ by 3 1/4″. This item is in NEAR MINT (minimal edge wear) condition and I chose not to scan the back because there are simply NO imperfections. If I were to pay to get this graded, the price would be in the $90 range. Keep in mind the large image is enlarged by TWICE the size of the original card. Quality cheesecake from when the pin-up was in its’ heyday. Categories: ART, PRINTS & PORTFOLIOS, PAPER PRODUCTS, MISC, TRADING CARDS. 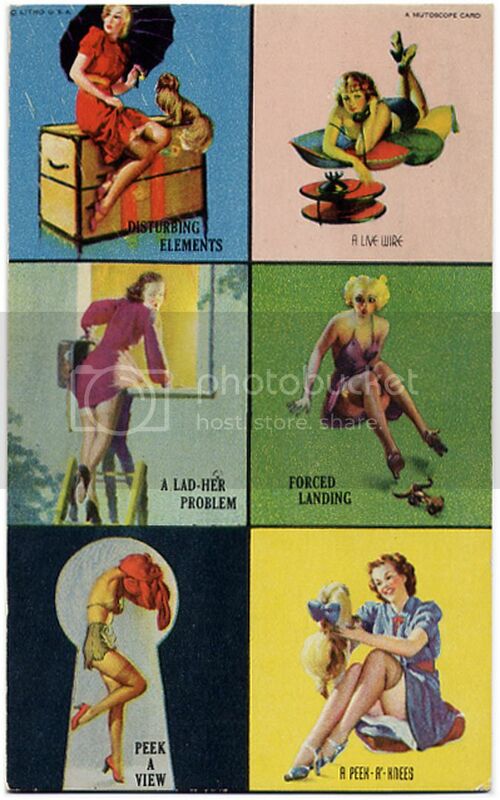 Tags: collectibles, A Lad-Her Problem, A Live Wire, Disburbing Elements, Forced Landing, Peek A View, A Peek-A-Knees, art, cheesecake, Gil Elvgren, illustration, mutoscope, pin up, Pop Culture, vintage girls. Be the first to review “DISTURBING ELEMENTS – A LIVE WIRE Multiple Image CHEESECAKE PIN-UP Mutoscope Card VERY RARE (1940’s)” Click here to cancel reply.